Important: as Blender 2.8 is still in development the following may be subject to change, especially buttons, their positions and icon/image representation. For Blender 2.8 Units options (units of measurement) still resides within Scene Properties. The primary selections for the Unit System also remain unchanged; None, Metric (default) and Imperial. Once set additional options are then accessible depending on selection ; Metric or Imperial include Length and two additional settings, Mass and Time . To access unit options, click on the Scene Properties button then the Units subheading to expose the available options. Metric is set as the default system unit replacing None. Setting up the units of measurement  for a project is still done in Scene Properties . 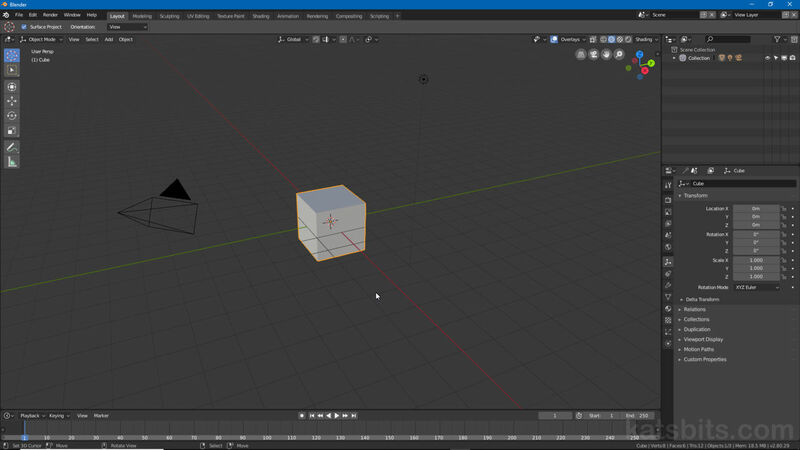 Setting the type of units of measurement  in Blender 2.8 using the Unit System  – Metric, Imperial and the default None and additional options  – Length, Mass and Time . Once the Unit System is set the grid can be further modified using Unit Scale. Altering this value changes the proportional size of the grids major or primary divisions relative to the base scale value, 1.000000, established when the Unit System is set. For example a 1:1 ratio between Unit System and and Unit scale (they’re both 1.0) means both system and grid scale match (the default cube being 2x2x2 is positioned so 1 unit is either side of the XYZ axes). At a ratio of 1:0.5 the grid appears larger because the unit scale is now half the size of the system scale (1.0) making the cube appear smaller. And at 1:2 a smaller, tighter grid is shown because more sub-units are visible per system base unit making the cube appear larger. Design note: Unit Scale is not the same as grid Subdivisions, the former being used largely to establish a projects overall ‘size’ or ‘scale’ (1:1, 1:1.25 etc), the latter for defining or fine-tuning major/minor (grid) cells and distances (10 minor units per major etc.). Unit Scale changes the size of each cell in the grid relative to the unit of measurement (Unit System selection) – at 0.5 each grid cell is twice as large as the default, at 2.0, twice as small because more units fit within the same space (this is not the same as subdivisions). In Scene Properties the settings and options for Units in Blender 2.8 now default to Metric rather than None.